For an increasing number of homeowners across North America, brown marmorated stink bugs are another sign of the changing seasons. The National Pest Management Association (NPMA) says these smelly pests are likely to be found congregating in attics and hanging on curtains, lampshades, screens and other objects inside homes in the coming months. "If you don’t want stink bugs in your house this winter, you need to be proactive now and set up traps in your yard by Labor Day." says Rod Schneidmiller, president of Sterling International Inc.
With no effective natural insect enemies in the U.S., stink bugs continue to expand into new areas. They’ve now been discovered in 41 states, most recently in Arkansas. The number of adult stink bugs increases during September and October, which makes it critical to capture them now before they move indoors. In the early fall as stink bugs prepare to hibernate, they are eating all the fruits, seeds, leaves and even tree trunks they can find. As food sources become scarce and daylight hours wane, the bugs exhibit zombie-like behavior as they search for shelter to overwinter. At that point, there isn’t much that will thwart their quest to get indoors. There seems to be a very tight window during which these bugs start moving from their feeding sites to overwintering sites. Dr. Qing-He Zhang, lead scientist and director of research at Sterling, developers of RESCUE!® Stink Bug Traps says "Homes are prime targets for overwintering. If you’ve seen one, you can be sure there are hundreds more waiting to come inside. You need to stop them in their tracks and break the stink bug life cycle before they come indoors to hibernate." 1. 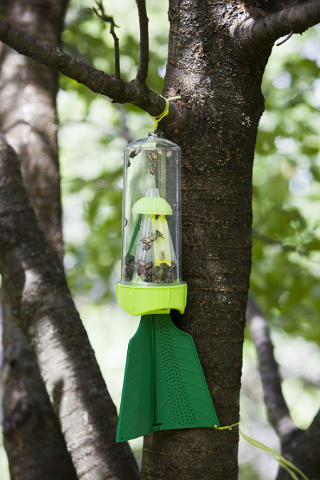 Trap them before they come indoors: To catch the stink bugs in the early fall before they move inside, hang a trap – like the RESCUE!®Stink Bug Trap – at eye level from a tree branch, stake or pole about 15-20 feet from the house. It’s important to trap them before they transition from feeding to hibernation mode – once that happens, they no longer respond to the pheromone. 2. Seal off entry points: Inspect the exterior of your home for easy access points. Pay close attention to areas around siding and window air-conditioner utility pipes, behind chimneys and underneath the fascia or other openings. Use silicone caulk to seal any cracks and holes. 3. Replace and repair: Check for damaged window or door screens and for torn weather-stripping and loose mortar. 4. Turn off lights: Keep outdoor lighting to a minimum. Turn off porch lights and pull down window blinds to prevent light from spilling outside. 5. Ventilate: Properly ventilate basements, attics, garages and crawl spaces to eliminate harborage points. Consider using a dehumidifier in these areas. 6. Think before squishing: When disturbed or crushed, stink bugs release a bad-smelling odor as a defense measure. Instead, pick them up with a tissue and flush them down the toilet. Do not throw them back outside. They will just turn around and come right back in. For more stink bug information and prevention, visit RESCUE! Established in 1982, Sterling International, Inc. offers RESCUE!® traps and attractants for stink bugs, wasps, hornets, yellowjackets, flies, Japanese and Oriental beetles and more. These products are available at home improvement centers, hardware stores and lawn & garden retailers throughout the U.S. and Canada. Find the closest retailer here. For more information and great tips, visit http://www.rescue.com. You can also follow RESCUE!® on Facebook and Twitter.